Nearly the end of May already, wow! We've been enjoying the cool weather and mostly sunny days, spending time outside gardening. 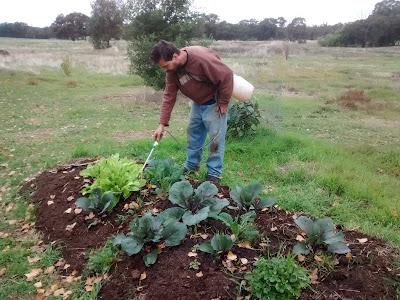 We have used two trailer loads of manure and compost around the gardens already and going for the third pretty soon. It's a funny word, gardens.. conjures up images of English manor houses.. But I realised when we were getting ready for our Permie Day that we have quite a few areas around the house that I could call a garden, so that's multiple gardens! Our friends from the Permaculture Riverina group came over last weekend and helped us out by planting an enormous amount of plants, which helped empty out the shadehouse for a start. The photo above is part of the kitchen garden. They helped dig it down and added a bunch of compost and manure to it. 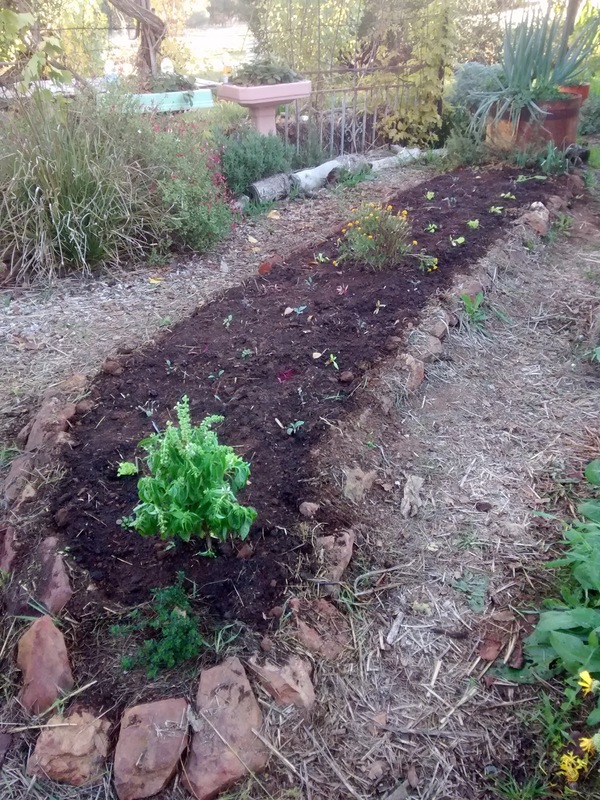 They planted seedlings of broccoli, kale, silverbeet, lettuce, and beetroot. There is also a basil plant that hasn't yet quit, and the only marigold I've managed to grow so far. The photo above is what we called the Pole Garden, only because a pole is all that is left of the old shed that once stood there. Well, that, and a bunch of rubbish still buried in the dirt below. I had a vague idea of what I wanted this area to look like, but it really came alive once the Permie group got their shovels into it! Marty and I worked out which plants we wanted there, but the detailed design was made up on the day, and it turned out better than I could have hoped. 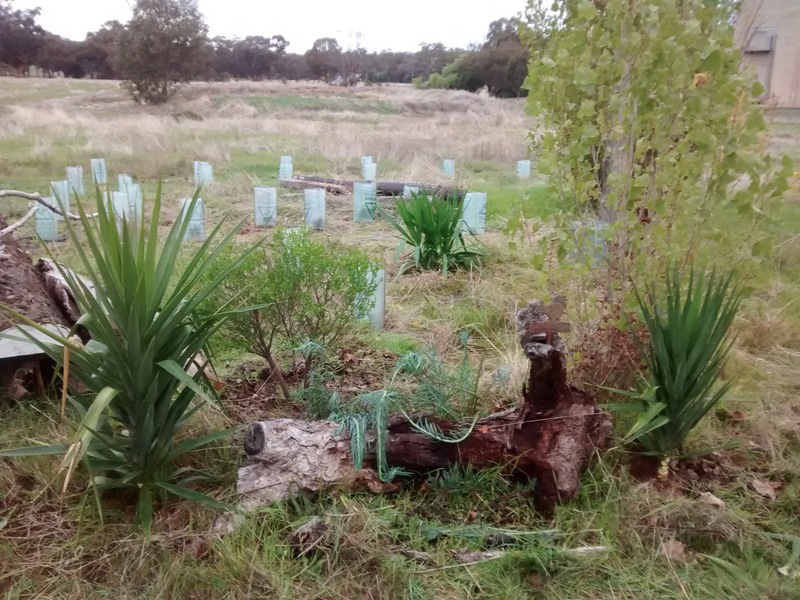 Now we have something to work with, we'll be planting more in this area. Actually, we did today! This is how it looks today from a different angle. The yucca's came from a guy named Clayton that we met at the tip. He had yucca plants with roots and everything, and we were happy to take a few from his green waste. :) There are some crazy suculant plants that Tracy from the Permie group gave us with their long stems are draped over the log. It's an odd spot - we didn't want another shed put there because it'd block a nice view, and the rubbish and old foundations make it difficult to grow anything too demanding there. The plants that grow there are going to have to be tough, but attractive enough to look out onto. 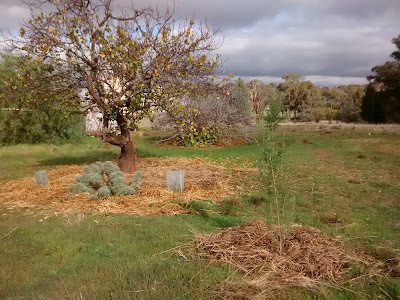 We moved the chooks from their summer home under the apricot and fig trees, and took the opportunity to feed and mulch the apricot tree. We may add something to the figs, but since the chooks spent most every day hiding under them from the hot sun, I imagine they're fertilised enough. Their leaves have fallen and mulched themselves, so there's not much more to do than a little pruning. The red-legged earth mite loves autumn, and it also loves silverbeet. We learned the hard way over the last two seasons, and this season we're getting them early with a home made white oil and chilli mixture. The photo above is of the hugle bed, only 2 years old. There are lots of mushrooms that pop up, there are 6 asparagus remaining, a few volunteer fig trees, perhaps one apple tree left (I'll know for sure in spring). 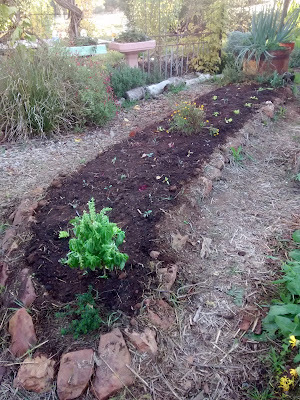 I planted a lot of garlic in the bed this year, and there's the brassicas in the photo. 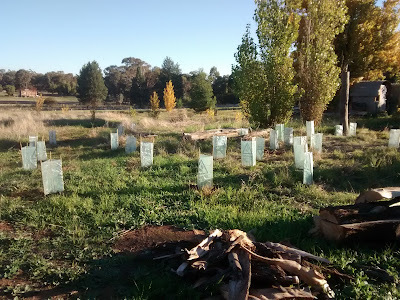 The Permies planted a lot of food too, and it's weed free and ready for the winter. Lastly, we've been doing the usual maintenance that goes with living in an old house. 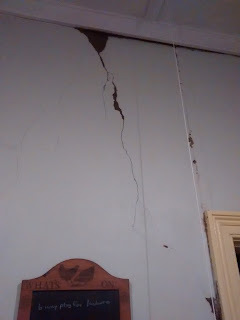 The photo above is a little crack that turned into a hole about the size of a fist when I poked at it. I made up a cob mix right away and filled it up. It's dry and ready for plaster any time now. I've also been fixing a hole in the bedroom that we didn't see until the mice started coming through. It was hiding behind a cupboard, so that was a mess for a few days as the mud and plaster dried. We're expecting cooling weather and some more rain this week, so I think our lovely long autumn is coming to an end. The wood fire is going during the night right now, but it might not be long before it's burning in the daytime too. Wow, you have been busy! I bet it feels good to see such progress.